Put the oven broiler on. Heat a medium, nonstick skillet over medium heat. Add the olive oil and sweet potatoes. Saute, tossing occasionally until potatoes are browned and fork tender (watch them carefully and reduce the heat if necessary - because of the sugar in sweet potatoes, they can burn easily). Add the onion, garlic, and a little pinch of salt. Spray additional cooking spray for the onions. Saute until onions are translucent. Add the baby kale with another spritz of cooking spray, and cook, tossing often, until leaves are very wilty. Sprinkle the flaked salmon over the vegetables. In a bowl, whisk together the eggs, egg whites, salt, pepper, dill, and cracked red pepper. Gently pour the eggs over the veggies and salmon in the skillet. Layer the cheese on top. Let sit on the stove-top on medium heat for a minute, then pop the skillet into the oven a couple inches under the broiler. Cook 4-5 minutes until eggs are set and top is lightly golden. Remove from the oven and let sit 1 minute. 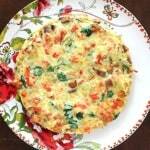 Use a rubber spatula to loosen the frittata and slide onto a cutting board or serving plate. Yields 4 servings.